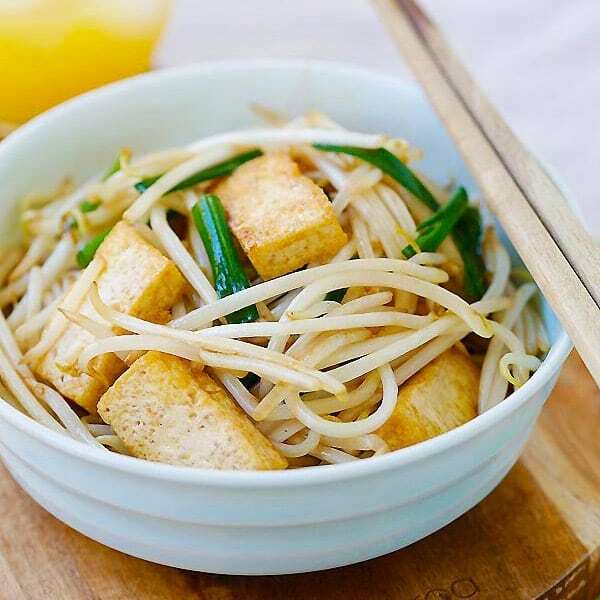 Bean Sprouts with Tofu - easy and healthy bean sprouts with tofu. Refreshing, delicious and a dish that goes well with almost anything. Following my Teochew porridge post on preserved turnip eggs, I would like to share with you yet another simple dish that goes well with porridge—bean sprouts with tofu. 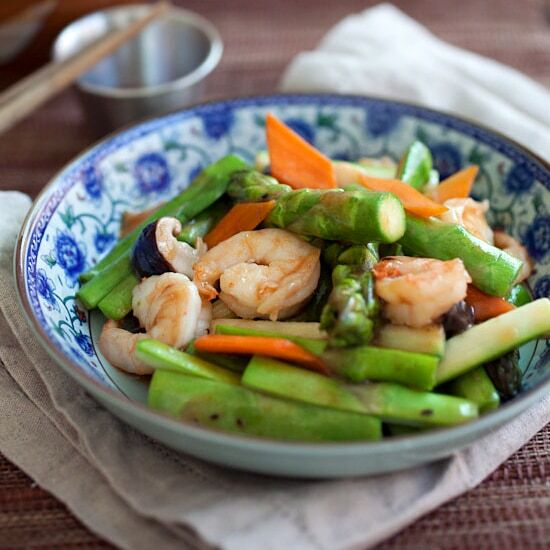 It is an absolutely humble dish of simple ingredients but so flavorful. Bean sprout, or properly known as mung bean sprout, is a healthy food that is loaded with vitamins, minerals, and it’s absolutely cholesterol free. 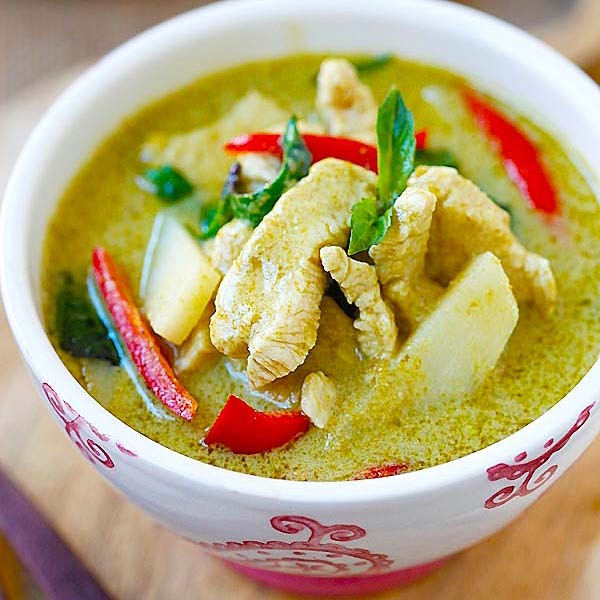 It’s used extensively in Asian food—in noodles, stir-fries, and vegetarian dishes. However, as good as it sounds, bean sprouts are not common outside of Asia. The crunchy and refreshing good taste are pleasing and it’s a taste that is easy to acquire. This bean sprouts recipe is good with steamed rice or porridge. It’s super easy to prepare and you can make it with salted fish, too, if you like. Rinse the bean sprouts with cold running water, drained and set aside. Remove the roots if you desire. 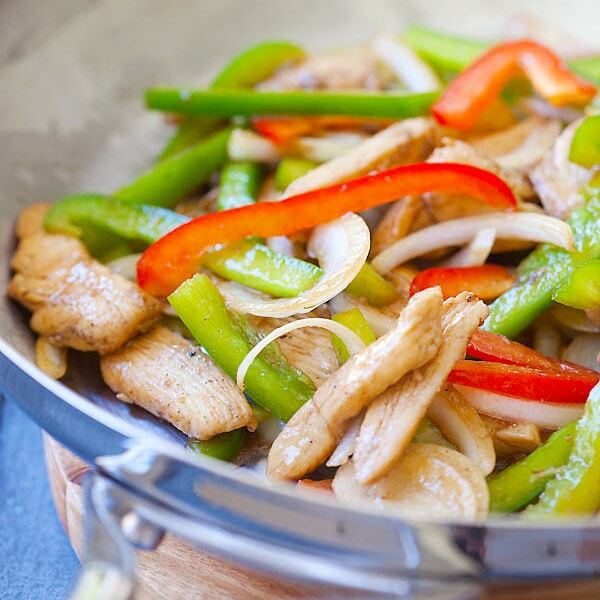 Heat up a wok and add some cooking oil for pan-frying the tofu. When the oil is fully heated, pan-fry the tofu until they turn light brown on the surface. Transfer them to a dish lined with paper towels. 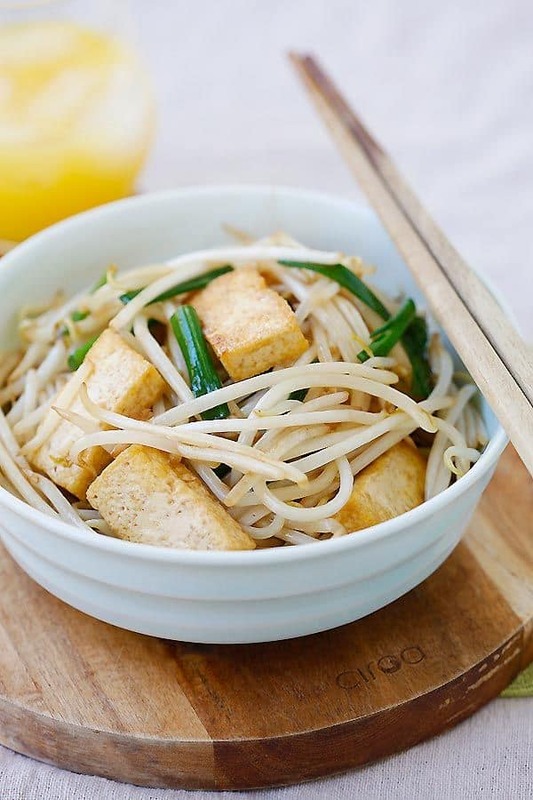 Leave about 1 tablespoon of oil in the same wok, stir-fry the garlic until aromatic, then add the tofu back into the wok for a few quick stirs before adding the bean sprouts. 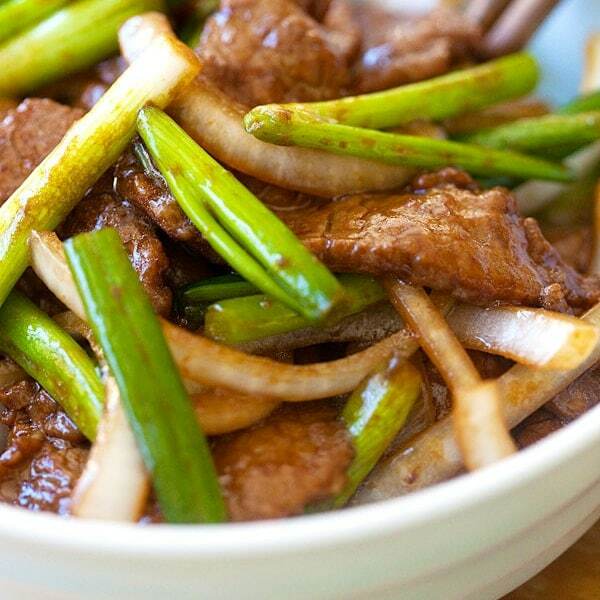 Add soy sauce, scallions, and do a few more quick stirs. Dish out and serve immediately. Bean sprouts should be crunchy and just cooked when served. Do not overcook bean sprouts as they lose the crisp and crunchy texture. All photos and recipes on Rasa Malaysia are copyright protected. Please do not use the photos and recipes without prior written permission. If you wish to republish this recipe, please rewrite the recipe in your own words instead of copy and paste and link back to //rasamalaysia.com/bean-sprouts-recipe/. Thank you very much! I’m a big fan of “tofu puffs,” as you call them. They can be so crispy on the outside, and so flavorful with the right sauces…and of course bean sprouts are an Asian staple. Thanks for sharing another great recipe! Tasty! Can’t wait to try. 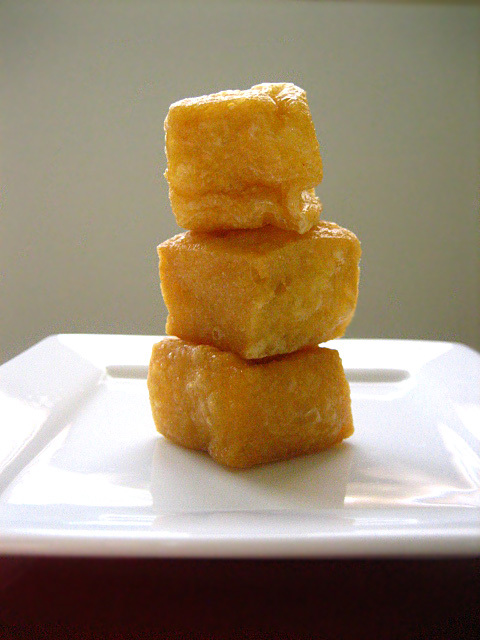 I hate to be difficult – but your ingredient list doesn’t even list “tofu puffs” … an amount or how to make them. Is this just fried tofu? Is it firm or silken tofu that’s fried? Do I do this BEFORE I sautee the garlic? I forgot to add it, it’s corrected. Add them after garlic. 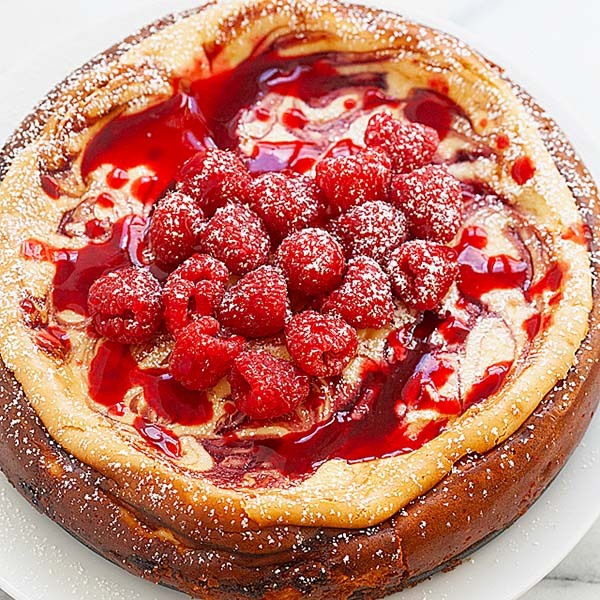 This recipe looks divine! But I have one question – where do the tofu puffs come from? They aren’t listed as an ingredient in the recipe, and I can’t find a recipe for them on the site. Is this something you buy pre-made? Help! Thanks! 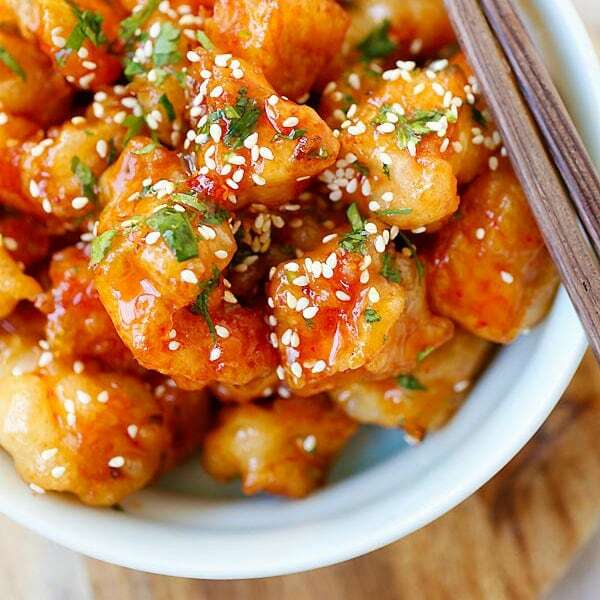 Can you explain exactly what tofu puffs are? Are they something you buy in the store, or make at home? There is no recipe on the website for them…. Thanks for the further clarification! Year to all….and Happy Eating! Stuff like this is simply the best. It reminds me of sitting at the dinner table with my family growing up. There are so many versions of stir-fried bean sprouts and tofu, but the simple ones are always the best. I love simple dishes and this is one I’m going to cook soon! I usually cook beansprouts on its own. As usual, great post! Btw, my sister bought me a grill maker. She said it is going to help me to lose weight because I don’t need to cook with a lot of oil and I can grill food with high protein like chicken, fish etc. Can you share some recipes that can cook on a grill maker? Looks tasty! I love bean sprouts – to me, they’re a must in certain Asian recipes! Like, could you imagine pho without them? I can’t! It just wouldn’t be the same. This sounds like something I could snack on for a long while. Looks simply, delicious and healthy. Love the texture of stir-fried sprouts. I have a post lined up regarding Tow Gay! For me, I have to remove the roots, which usually give a raw unpleasant taste and I think that is an acquired taste. Your bean sprouts looks very crunchy indeed. Looks delicious. Absolutely love the bean sprouts you get in East Asia, they dont grow so well even in India, its totally different. I have actually never tried cooking bean sprouts!! Plus I love tofu puffs as well – sure gonna try cooking them taugeh now. my amah used to stir fry bean sprouts (with roots removed by whatever grandchild could be coerced into doing so hahhaha) with just garlic and at the last moment, add scallions and dash of sesame oil. heaven!! Haha, I agree, I used to be coerced to pluck the roots when I was little too. Sooooo boring and the bean sprouts look like a mountain. I love bean sprouts, this simple dish is great. However, like a few others, I prefer to trim the roots for better taste and styling. This is a simple dish and yet looks so good. Awesome. This looked so yummy, I knew I had to make some. Just finished some for lunch today. Thanks for posting this. I’m new to this website. Find all your recipes extremely right for my style, simply realistic, very traditional, ingredients are simple, cooking style so real, ingredients are not hard to find. In other words, easy to whiff out but idea, combinations and taste are exciting. And curious – are you traditional chinese malaysian or singaporean? My guess is you are a malaysian cook cos lots of traditional fantastic ideas. But of course, rasa malaysia is the contribuition of proud malaysian dishes. Silly of me. I’m enjoying all the posts. Perfect breakfast recipe! Looks very yummy. Thanks! Keep posting easy and quick recipes. 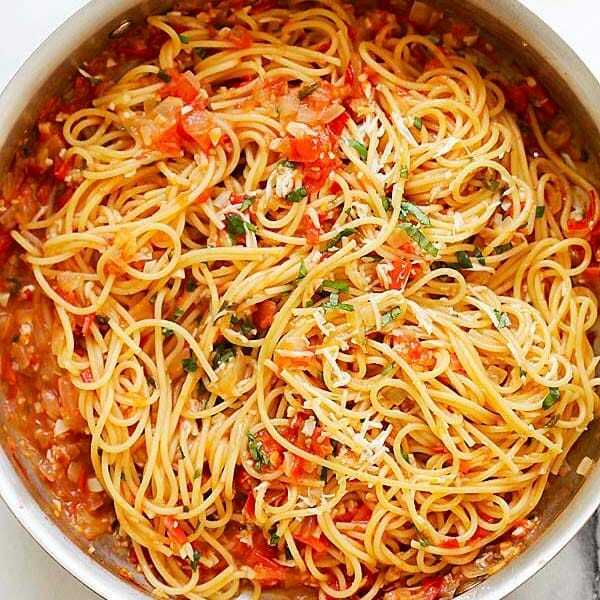 This is a very late comment, but I just want to say thanks for posting this simple yet delicious recipe. I made this for dinner today as a side dish and surprisingly my carnivore husband loved it! I love this dish. My mom would make it with coagulated pork blood instead of the spongy tofu. You’re right. My mom made it that way, too. This recipe is beautiful and simple. I had the ingredients, and they practically cooked themselves. Then they were a tasty, light meal. Thanks! with this hot weather I am excited to try this recipe!